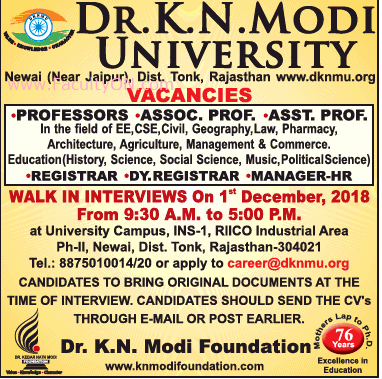 Looking for Dr.K.N.Modi University Rajasthan Vacancy 2018? Dr.K.N.Modi University, Rajasthan has advertised for recruitment of Teaching Faculty- Professor / Associate Professor / Assistant Professor Plus Non-Faculty jobs vacancies. Interested and eligible job aspirants are requested to walk-in on 01st December 2018. Check out further more details below. About University: Dr K N Modi University, a State Government ordained, UGC approved Private University, situated on a sprawling 45 acres campus with sylvan surroundings is situated at Newai in the Tonk district of Rajasthan. It is being managed by Dr K N Modi Foundation, whose Founder Dr Kedar Nath Modi was a doyen in contributing to the cause of the Society and a pioneer in establishing educational institutions to offer quality and value based education – primary to higher levels of professional education – in the background of his committed belief, “Education Builds Nation” , to the members of the learners community belonging to diverse economic and economic strata’s of the society. How to Apply: Interested and eligible candidates are requested to send application along with complete resume, copies of certificates / testimonials and recent PP size photos to the email address provided below and then attend the Walk-in interview.